MORE ABOUT Kirkwood Dental: Kirkwood Dental Associates was founded over 50 years ago by three dentists with the primary objective of providing the most advanced dental care possible at a reasonable cost. The practice has since expanded with two locations (Prices Corner area and Peoples Plaza) and five dentists with over 100 years of collective experience. Extended hours are now available including evening, Saturday, and early morning appointments. Each office is equipped with the latest technology in a warm and welcoming environment. 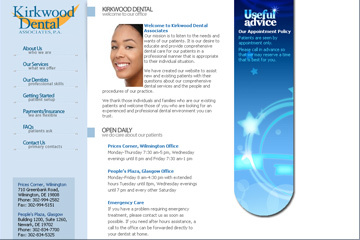 Kirkwood Dental patients should always expect excellent dentistry and five-star customer service. Expanded dental services are offered for both children and adults including teeth whitening, porcelain veneers, and dental implants. Several flexible payment options are available so patients can maintain optimal dental health and beautiful smiles! Appointments can be made with one of our friendly receptionists by calling 302-834-7700 (Glasgow) or 302-994-2582 (Prices Corner). Consults are complimentary. Ask about our teeth whitening specials!